The first natural occurrence of a low-pressure CaAl2O4 mineral has been found in a refractory inclusion in a carbonaceous chondrite meteorite. While synthetic low-pressure and high-pressure CaAl2O4 phases are well known in the field of materials science, only the high-pressure polymorph had been identified previously in nature (in another chondrite). Quantitative elemental microanalysis of the new mineral using the electron microprobe resulted in an empirical formula (based on four oxygens) of Ca1.02Al1.99O4. It is now officially approved by the Commission on New Minerals, Nomenclature, and Classification of the International Mineralogical Association as 'krotite'. The mineral's name honors Dr. Alexander N. Krot, a University of Hawai‘i at Mānoa researcher known for his achievements in meteoritics, especially for studies of the formation of calcium-aluminum-rich inclusions (CAIs) and chondrules, and his significant contributions to the understanding of early solar system processes. 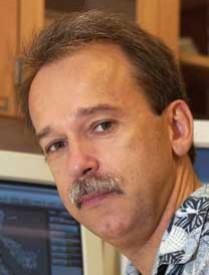 Krot is also a 2004 recipient of the University of Hawai‘i Regents' Medal for Excellence in Research. 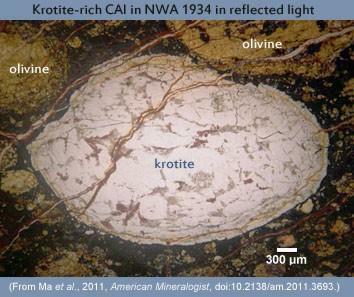 Krotite is the dominant mineral in the central and mantle areas of an unusual CAI in the NWA 1934 carbonaceous chondrite. The 2.75 mm x 4.5 mm inclusion is composed mainly of aggregates of krotite crystals, with a few other calcium-aluminum or magnesium-aluminum oxides and a few silicates in a thin rim of concentric layers. Cracks, mainly filled with iron and aluminum hydroxides, crosscut the CAI's rim and parts of its interior giving it a "cracked egg" appearance. The CAI itself is surrounded by a matrix of mostly fine-grained olivine. The discovery team suggests formation in a highly refractory condensate/evaporative environment in the cooling nebular gas. They say that the primary mineral assemblage in this CAI was introduced into a hot gas, which did not melt the CAI but perhaps reacted with surficial krotite crystals to produce the observed layered rim. The cracks may have been caused by compaction during accretion of the parent body, but the meteorite as a whole is essentially unshocked. A final, probably terrestrial, alteration process most likely filled the cracks with hydrated oxides during exposure to the northwest African environment. This CAI, along with its new mineral, krotite, will be the subject of additional research to determine formation and cosmochemical details. Because CAIs were the first solids formed in the solar nebula about 4.6 billion years ago, they help cosmochemists piece together records of nebular and early solar system processes and how the first solid building blocks eventually turned into asteroids and planets. Dating the Earliest Solids in our Solar System http://www.psrd.hawaiii.edu/Sept02/isotopicAges.html.